A new Ask the Devs posted on the official Black Gold’s website may give hope to fans wondering when Snail Game’s Steampunk MMO would head into beta. 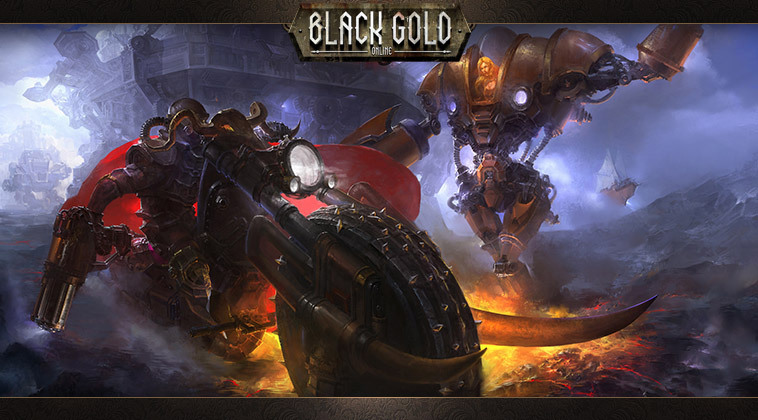 The Q/A post delves into what sets Black Gold’s Steampunk world apart from other MMOs, and confirms a total of 18 classes with unique visuals. The post goes on to clarify Black Gold’s dynamic events which are said to trigger when players enter a specific area or complete a certain number of quests. The events are meant to be considerably harder with bonus rewards and will require players to complete clear objectives. One of the questions posed was in relation to when Snail Games estimated the beta would begin. Snail indicated the first closed beta was planned to launch at the earliest in Q1 of next year, 2014. The beta won’t be first come first serve, but Snail Games does intend to give higher priority to those that signup before the beta goes live. Snail Games also responded to questions regarding publishing areas and IP blocks for Black Gold, stating “There will not be a country block or IP block for the North American version of Black Gold Online at initial release, but we will adjust accordingly to ensure smooth ping across the servers.” For now though, players in regions outside of NA will need to connect from abroad in order to play. Those who have yet to signup for Black Gold’s beta can do so here. When do they start to understand that the western market is much diffrent from the eastern market? With this paymodel this game will fail in 2 or 3 months in the west. In the west we dont go to I-NET coffeshops and buy time to play a game (this is normal in the east most people there dont play games at home they go to an I-NET coffeshop and pay per houer to play the game.) For them its normal practice to pay for a time set. In the west we dont understand this at all we wanna buy a game and play it or its free to play then we decide to pay stuff or not. This model is clearly for a eastern community (they dont gonna have problems with that at all cause the time you get the items will be included in the time you pay for in the I-NET coffeshop). So please get some specalists for western marketing in game payment models or you are doomed. Another MMO thats going to get shut down. Move along. Awful lot of backpeddling. While I can see they’re getting at least a little smart about what the west wants, at the same time it seems they’re willing to compromise too much. I’ve seen a lot of games fall from grace because of the consistant screaming of players (like SWTOR) and turn into consequence-free, money-grubbing garbage. With the way snail is acting, I don’t even think this is worth the time. The blind leading the blind. Heard about the controversies around this title. Don’t think this game deserves much of a look from me. why every freak guy, yes im self but why mounted,mounted.. I thought there was a Martian version of the site.